However well equipped the workshop may be there seems to be an incessant need to make up special gadgets of one sort or another. These may range from mutilating a clothes peg to act as a 'third hand' up to major modifications to an existing machine tool. The making of such devices can be fun (indeed, some may appear to do nothing else!) but nevertheless the time taken up in 'devising the device' can often delay the completion of an important project. Shared experience is a most potent tool in reducing such delays, and can, moreover, often provide solutions to problems hitherto believed to be intractable. 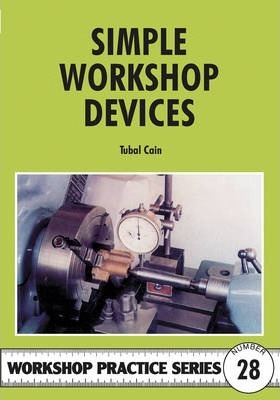 Tubal Cain has enjoyed more than sixty years' experience in designing and building engines and machines (in both full size and model dimensions) and over this time has made many ancillary devices. In this book he shares 52 of them with you. A number of these had been published in magazines from time to time and some were assembled in volume form about thirty years ago. The opportunity was later taken not only to reprint that book but to revise some of the entries to take advantage of user experience, to add new material and to introduce it into the popular Workshop Practice Series. Five Clamp and Vice Projects. Ten Jigs and Fixtures. Twenty-five Projects Round and About the Lathe. Thirteen Miscellaneous Projects.